No swimming, wading, or bodily contact with the water. Alcohol is prohibited in all areas except the campground. The speed limits in the park are strictly enforced. Daily fishing permits are required and must be purchased prior to fishing. Anglers found without permits may be asked to leave the park and forfeit all fish. Charcoal fires only-no wood or presto logs. EXTREME FIRE DANGER AREA. No firearms (including air propelled), bows or other weapons allowed in the park. 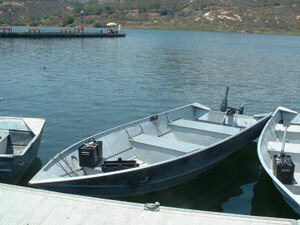 Private boats or private gas-powered outboard motors are not allowed. Lake and shoreline areas east of the buoy line and the dam are closed to the public. No gathering of vegetation or disturbing or harassing animals. For a complete list of rules and regulations contact a Park Ranger at (760)839-4680. Failure to comply with these or other park regulations may cause immediate suspension of camping, fishing, or other privileges within the park by the Park Ranger. All fees are forfeited.